Under the command of Captain Barber, the new squad of mounted police in the down town district did excellent work yesterday. It was the first day of their regular service, and working at the crowded corners of the loop district, Policeman George Wiedling and Joe Zeible were the first to receive the commendation of Captain Barber. The force at present is composed of twenty policemen, but will later be increased to 100 officers and men. The mounted policemen who have heretofore been stationed on the boulevards and in the parks will in the future be located at the busiest corners of the down town district, and it is expected they will play a prominent part in the regulation of traffic. The twenty members of Chicago’s mounted police squad in 1906. The Chicago mounted police made their first arrest yesterday, the offender being a man who was “making a rambling speech on municipal ownership.” Looking at the matter from the point of view of the city hall, this would seem like a bad beginning. 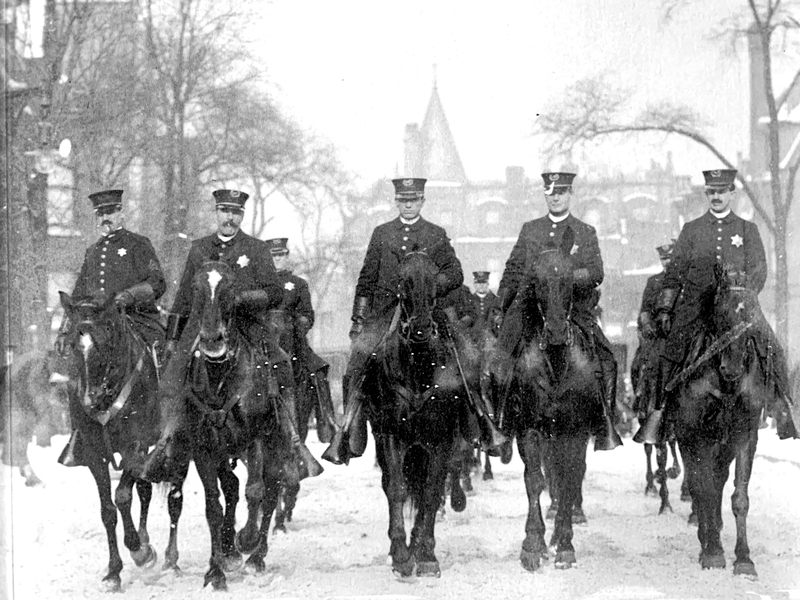 Chicago Mounted Policemen on a snowy street in 1907. As a result of the agitation over the unprecedented congestion inside and on platforms of street cars, Chief Collins’ new squad of mounted police will be transformed today from roving free lances into useful public servants. Just how useful remains to be seen. At 7:30 o’clock this morning twenty-six mounted patrolmen will be detailed to beats in those parts of the downtown district where traffic congestion is greatest. It will be the business of these officers to keep the wagon traffic moving so as not to impede the progress of street cars around the loops. In State street two police horsemen will be detailed—one to patrol north and the other south from Madison street. In Madison street there will be two—one patrolling east and the other west from Clark street. In similar manner Harrison, Van Buren, Clark, Randolph, Washington, Lake, and Dearborn streets, and other thoroughfares containing car lines will be patrolled. The squad will receive instructions to keep traffic moving without playing any favorites. Teamsters are not to be allowed to back their wagons up to the curb except where absolutely necessary, and then the horses must be kept off the car tracks. Recalcitrant teamsters are to be arrested. How this plan will work out is a matter of speculation among persons familiar with the general police incompetency in handling the downtown crowds. When Chief Collins was permitted to organize a squad of mounted officers it was the understanding that they were to be assigned to the direction of traffic, as in New York. The company went into commission with forty mounts, fully equipped, two months ago, but since that time has scarcely been heard of. No systematic assignment of the officers to the direction of traffic was made, and, for the most part, they roved the streets occupied with the attention they personally attracted. On infrequent occasions one would be seen in the loop district, and the only one to win public notice so far in the history of the squad was a patrolman who was thrown from his steed. For the most part the police will have to use their common sense in directing traffic, for Chicago has no rules of the road worthy the name. Compared with New York, Chicago is the teamsters’ paradise. By the local police teamsters are allowed to block street cars and cut across the line of traffic in manifold ways that the New York police do not tolerate an instant. An ordinance providing rules of the road is pending in the council. 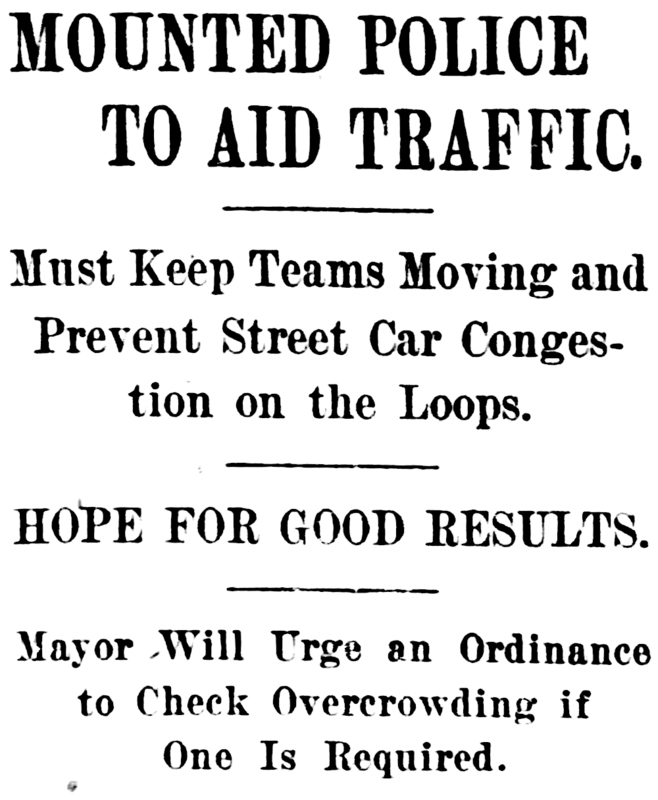 “There will be no more congestion on the downtown loops if the mounted police do their duty. Their first day on the assignment will be a severe test, for Friday is the worst day of the week for car congestion. It is a curious thing that there is much more congestion on Mondays and Fridays than any other days of the week. As for the overcrowding in street cars and the elevated trains, we can do nothing until the corporation counsel informs us of our powers in the matter. The option will be ready tomorrow, and then Chief Collins will know whether or not he can assign policemen to prevent the overcrowding of cars. New Ordinance May Be Passed. If the corporation counsel decides that police regulation is illegal under existing ordinances Mayor Dunne favors the immediate passage of the Doty ordinance defining the limit of a street car’s capacity as 50 per cent more than the seating accommodations. I don’t believe, however, that the city ought to bear the expense of policing the elevated platforms. The elevated roads ought to have a sufficient number of guards on each platform to see that the cars are not overcrowded and to see that the passengers board on trains safely and that the gates work properly. If the elevated roads refuse voluntarily to put such regulations into effect I am in favor of the city compelling them to do it. If it is necessary to police the platforms the company should be compelled to pay the expense incurred by the city. In its contact with the public the “Mounted” occupies a most fortunate position. Being conspicuously seated high on well groomed horses and patrolling (for the most part) the Loop District, all Chicago has come to know these select policemen. Law-abiding citizens regard the mounted coppers as their best friends, and crooks are fearful to ply their nefarious trades within the panoramic sight of these officers who can look down and into crowds. Speeders and other violators of auto ordinances hesitate to take a chance in the Loop since one of the “Mounted” is sure to catch their number, much to the delight of pedestrians who could scarcely be safe at all in congested spots were not the “Mounted” on guard. With the concentration of the “Mounted” the morale has very measurably increased. Instead of going out in small groups as heretofore, the men in this division are sent out in two troops, one at 7 a. m. and one at 12:30 o’clock. Now, the “Mounted” gives pedestrians a unique thrill as the long line of officers suddenly turns a corner and advance two abreast to the musical clattering of hoofs on the pavement. One mounted policeman at a corner, true enough, is a picturesque feature of the life of the Loop-yet he is often lost sight of in the rush of traffic. But riding in column with his mates, his presence assumes an added importance. One is reminded of some famous cavalry troop on the way to battle, ready to strike down the foe with hoofs and sabers and bullets. Only these troopers are, for the most part, on a peaceful mission. Their appearance always interests passersby and many stop and line the sidewalk as for a parade. As the officers reach a street crossing, a bugle note rings out and several drop from the column and take their posts of duty, this process continuing until each individual. policeman is in his assigned place. Those who have been in the army will recognize the similarity of this system to the placing of a guard detail, although it differs in some points. In fact the discipline of the entire Police Department is very much the same as that of a military company, or rather regiment. The salute to superior officers is required and the same obedience as in the army is essential. The similarity almost stops there, though, since the rank and file have considerable more prestige than a private in the army. The captains, lieutenants and sergeants are a great deal more “chummy” with their men and the team work of the department and especially of the mounted section is remarkable for its efficiency. The duties of a mounted policeman can best be described as everything that a policeman on foot does and a great deal more. He relieves the traffic officer at intervals, he answers the multitudinous questions of women, children and men, he spies out law-evading motorists, sees that nuisances are kept off the street, is ready to go crowds of the curious when things unusual occur—acts as a handy man for the benefit of Jaw and order in every other way, reasonable and unreasonable. There are altogether 142 men in the mounted police organization, headed by Captain Lavin as chief of the general traffic squad, Major Bauder as drill master, Lieut. Martin in direct command, Lieut. Weideling in charge of detail, and, of course, Chief Fitzmorris in executive control. It forms the basis not only of the traffic squad but serves as the fundamental element for a quick moving force when great emergency arises. When such a disaster as the Eastland catastrophe, or a race riot or other serious occasion calls for immediate police attention, the department is organized to have a company at the seat of the trouble in from five to fifteen minutes-including not only mounted police but a motorcycle squad, ambulance surgeons, nurses, patrol wagons and all the necessary personnel and equipment. Few people realize what a large service the “Mounted” renders as an agency for first aid and protection. 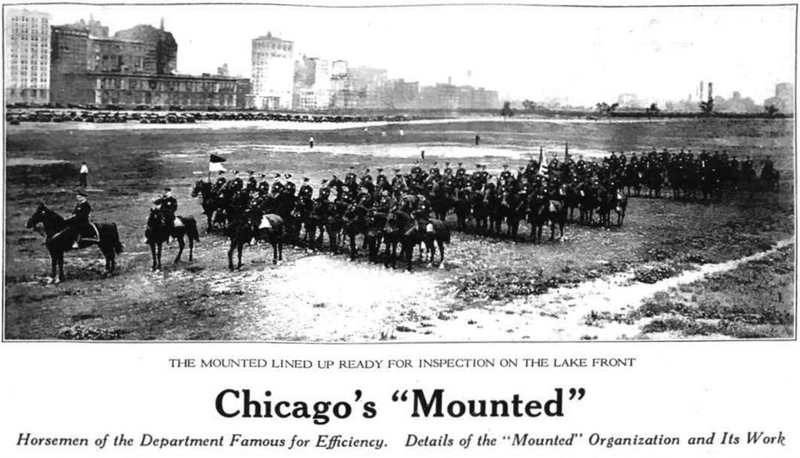 The district served by the “Mounted” extends from Halsted Street to Michigan Avenue and from 12th Street to Chicago Avenue, although the large majority of the horsemen are of course in the Loop proper. What the Loop would be without the “Mounted” to enforce the parking laws can be imagined when it is considered that there is room for only 2,800 autos to park in the district if every foot of space were occupied. Since an average of some 35,000 autos are in the Loop each day, the congestion that would follow in the absence of “Mounted” supervision would undoubtedly be chaos indeed. Each man has a post extending from one to four or more blocks, the distance varying with the importance of the district he is patrolling. His chief work is, of course, to keep traffic moving without confusion. From his elevated position he can command an unobstructed view of the street and with the added advantage of being able to move at a gallop if necessary, there can little escape his practiced eye. When the crossing policeman needs relief the mounted officer takes his place, using the familiar “move up” system in regulation of traffic at the intersection. That is, for example, he places his horse directly across the street and blocks the east and west traffic. When the proper time has elapsed he rides his mount to a point where he blocks the north and south traffic, and at intervals keeps making a circle around the corner. 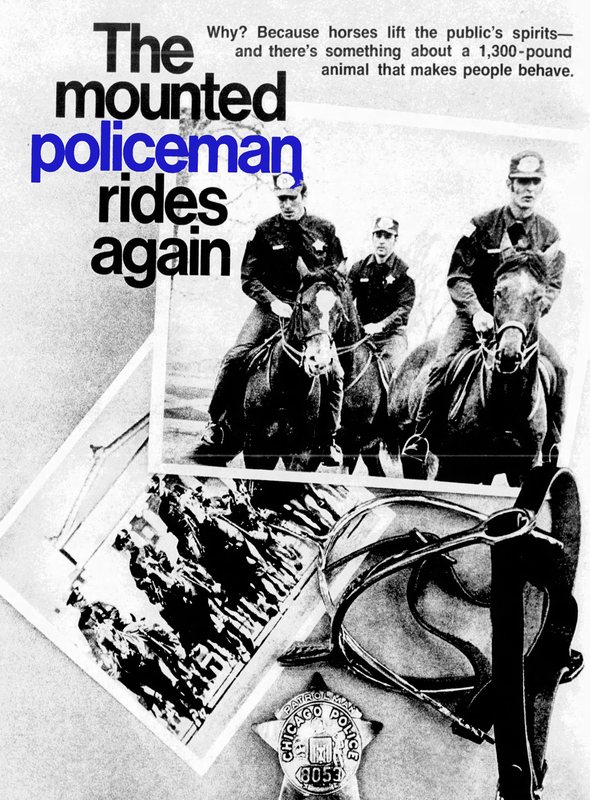 The mounted policeman’s life is an interesting one, despite the monotony of spending six hours a day actually in the saddle and from two to four more at various other duties, including the thankless task of appearing in court as a witness against law breakers he has himself discovered. Their senses are always keyed up for the “big moment,” which may arrive at any time. There is always possibility of romance popping out from around the corner. Not so very long ago two mounted policemen saw a man running away from the Congress Hotel. Becoming suspicious they followed him for a short distance on their horses. Then, convinced that they had to do with a criminal, they dismounted and rushed into the old building where the fleeing man had disappeared. They were met with a fusillade of shots from a dark stairway. Returning the fire they pressed on up the stairs, seeking whatever cover they could, but in constant danger from the bullets hailing down upon them. The building was pitch dark- all the officers had to guide them was the flash of their opponent’s revolver shots. The criminal evidently knew the environment,for he kept on up many flights and led his pursuers to a spot where a little light filtered in from the outside. His shots came closer and closer, but the police, true to their code, first tried the expedient of disabling their foe. One of them taking a desperate chance stepped out almost into the open and with a quick aim shattered the man’s pistol hand. It was for this exploit that a gold medal was awarded this gallant officer. The mounted policeman can be depended upon to shoot fast and straight. One of the officers for fourteen years held the pistol championship of the state and several times has won the national championship. The men are thus inspired by a conspicuous example in this regard. They are trained to send bullets precisely where needed and nowhere else. They take no risk of injuring the innocent bystander when trying to stop a wrong-doer, for they make their shots tell in the proper spot. It may be hard to convince an auto owner who has been reported for disobeying the parking ordinance, that the mounted policeman is always courteous. Yet that, too, is a part of his training, and unless pressed beyond the limit that human nature can stand, he acts on the theory that a soft answer turneth away wrath. If a law-evading motorist happens to be “bawled out,” he doubtless on second thought will agree that he got no more than he deserved. But in the ordinary happenings along his post the mounted officer is conspicuous for his courteous attention to all questions and requests made of him. Our mounted police is a source of much congratulation to the city’s officials when visiting delegations inspecting police come to Chicago. From the moment of their snappy roll call to their mounting of their horses as one.man and their return to headquarters, tired from their days work, they are erect, soldierly, well groomed, well behaved and altogether a wonderful aid and proud asset of our city’s life. 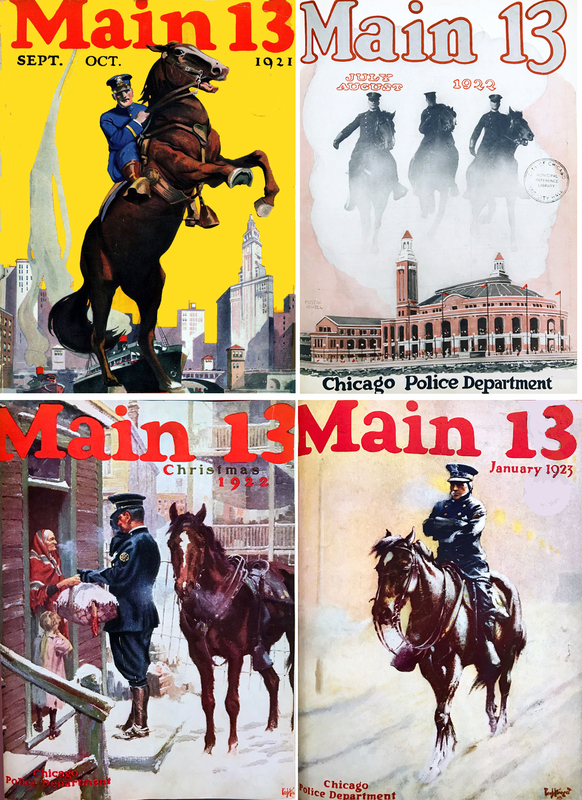 Covers from “Main 13” featuring Chicago’s Mounted Police from 1921-1922. At 7 :00 a. m.—about the time you and I are at breakfast, the first contingent of Chicago’s 150 Mounted Police are lining up in the big squad room at the La Salle and Illinois Streets headquarters, for roll call, finds his horse in the stall all saddled and groomed, and a moment later is awaiting Bugler Cairns’ call to mount as one man, and march off to duty. Even people who live on the daily line of march never cease to enjoy a thrill at the sight of these well groomed policemen and their horses as they ride two abreast to duty. As the crossings are reached the bugle sounds and one by one the officers drop out and proceed to their posts, until only the bugler is left, when he hangs his bugle on his pommel and takes his post. Then a half hour early, Bugler Cairns returns to head quarters to lead the second, or 1 o’clock contingent to duty. At 5 o’clock, eight “extras” come into the loop, and after the second con tingent goes off duty at 7, remain until the theater crowds have left the loop. When the Mounted Police get back to head quarters, they first unsaddle their horse, then answer roll call, turn in reports of the happenings on their beats, file any summons, and appear in court as witnesses against lawbreakers they have discovered. Once a week, the Mounted Police have drill in Grant Park. An officer rides the same horse at all times. Naturally the men become very much attached to their mounts. Indeed, these beautiful horses are favorites with the populace in general. Serious men, messenger boys, business girls and women of leisure, all indulge them in a bit of petting and lumps of sugar. When a policeman leaves his horse for a few minutes —while it would not move from the place it was left—it sometimes steps up on the sidewalk and, in a most friendly way, bids for this attention. But if you tried to coax one of these horses down the street ‘with a lump of sugar, he would only look wistfully at the confection and remain true to his post. But there is more than a sentimental reason for an officer always riding It is much easier on both horse and rider, as they become used to each others ways. The first three weeks, with a new rider a horse will invari ably lose weight. Most riding is done with the knees and heels of the rider. Without a word or the use of the reins officers are able to turn their horses around, and back them into position. Therefore, when a horse becomes broken to this method of command, —while it would not move from the place it was left—it sometimes steps up on the sidewalk and, in a most friendly way, bids for this atten tion. But if you tried to coax one of these horses down the street ‘with a lump of sugar, he would only look wistfully at the confection and remain true to his post. But there is more than a sentimental reason for an officer always riding It is much easier on both horse and rider, as they become used to each others ways. The first three weeks, with a new rider a horse will invariably lose weight. Most riding is done with the knees and heels of the rider. Without a word or the use of the reins officers are able to turn their horses around, and back them into position. Therefore, when a horse becomes broken to this method of command, a strange rider naturally irritates him, for he will unknowingly give wrong signals. Also a new rider will cause saddle marks to appear on a horse in one day, due to the fact that different riders do not sit the same in the saddle. For six hours each officer of the Mounted Police works from his saddle, keeping traffic moving in the middle of the blocks. He checks automobiles to see that there is no parking between 7 to 10 a. m. and 4 to 7 p. m. on streets where there are car lines, and that on all streets in the loop, no one parks for more than 30 minutes. There is parking space in the loop for but 2,800 automobiles, with an average of 282,000 coming into the loop each day, to say nothing of other types of vehicles, plus a moving net of street cars. Nearly every street car in the city enters the loop, which is more cars than travel over any other area in the whole country. Therefore. 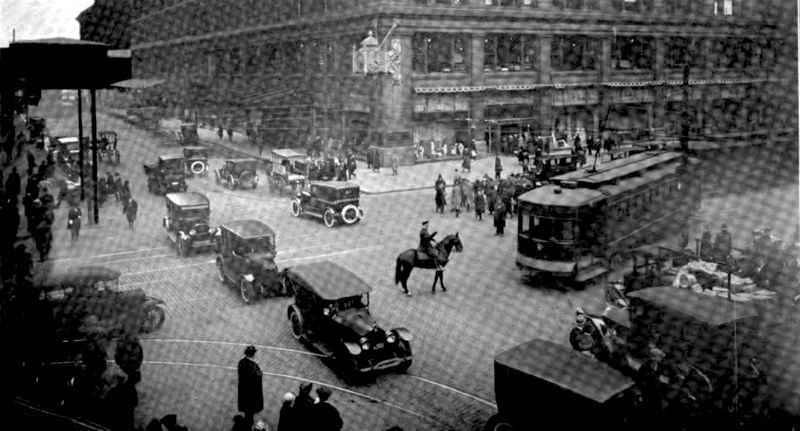 it is to the Mounted Police, in no small degree, that the pedestrian, the automobilist, the truck driver and the street car, owe thanks that under present conditions, loop traffic can move even as rapidly as five miles an hour during rush hours, and that this moving is orderly. For instance, almost any Wednesday at matinee time on Randolph Street, street cars are thick, automobiles are sandwiched in between a yellow mass of taxis, and if a coal truck emerges from an alley, it clogs traffic entirely, until, from his mount across the street. the policeman signals this one and that, and gets the wheels in this chaotic mass to turn again. The corner policeman would be powerless to control such a situation. Also, it is interesting to watch a Mounted Policeman direct the orderly parking against the curb of the truck wagons, as they stream into South Water Street early each morning with their loads of fresh vegetables, fruits and flowers. “How many minutes do your corner police allow for traffic to go each way?” I asked Lieut. Martin, who is in direct command of the traffic police. At times during the day a Mounted Policeman will relieve a corner officer. In such instances, he places his horse directly in front of one way traffic while the other moves, then in turn he takes a position in front of the traffic from the opposite direction. The mounted police have a great advantage over the foot police in regular duty, for they are where they can look down upon the crowd for a block or more and spot pickpockets or auto thieves, or pursue a crook at gallop speed. In numerous cases mounted policemen have chased a man racing from justice, dismounted and followed him into some dark alley and brought him forth. As the result of regular target practice, his aim is straight and sure. It is interesting to know that our own Lieut. Weideling has held the national pistol championship for several years. In such emergencies as the fire just west of the loop, or the race riot on the South Side, one mounted policeman can accomplish as much as several officers on foot, for he is out of reach of the mob, but in an advantageous position for compelling order. No city in the country has as many mounted police men in its business district as Chicago. Some cover only one block—others cover several, where the traffic is less dense. At one time the mounted police were scattered throughout the city. When Chief Fitzmorris took office, however, they were all concentrated in the territory between the lake and Halsted Street, Twelfth Street and Chicago Avenue, it having been demon strated that foot policemen could do as well at the out lying posts and at a less expense to the city. Incidentally, the concentration of mounted police in the busiest portions of the city was looked upon with bitter disapproval by the children of the Nettle horst School where Officer “Cap” Anson on his horse “Jimmy,” was stationed. ‘The children immediately wrote a pleading letter to the Chief asking for their “Jimmy policeman” back. Getting no results, fifty of them marched to the Mounted Police headquarters. Not ?nding authority there to help them out, they reduced their representatives to twenty-five and with Alderman Stephens at their head, marched to the City Hall to interview Chief Fitzmorris. “We want our ‘Jimmy policeman’ back,” they urged, “the one whose horse says ‘Good morning’ to us, and shakes hands, bows, smiles and shows his pretty teeth.” However, while they did not fail to touch the heart of the Chief, the request could not be granted. “Cap” Anson (no he is not related to the late famous ball player, but he is quite as popular among his fellow officers and on his beats) is now stationed in the Madison and Washington vicinity, but he is on a new mount. Eleven weeks ago the police veterinary pronounced the “Jimmy.” loved by the school chil dren, too old and stiff for our pavements, so “Cap” Anson bought and retired him to a farm. Sergeant Dunsing, coming off his beat on his mooneyed Fritz, was introduced to me as the oldest man in the Mounted Police service. Lieut. Martin took me through the stables, and as he passed along, a nose shoved out from every occupied stall, to be petted. Over each stall is a pulley to which the saddle is slung and hoisted up out of the way. “The stable boys saddle the mounts after feeding and grooming them, the grooming being done with a vacuum cleaner instead of the old-fashioned curry comb,” Lieut. Martin explained. “Feeding begins at four o‘clock in the morning. The horses are not fed again until they come off duty and then, if the day has been warm, they are left to cool off first. “The mounts are inspected every day and thoroughly examined twice a year. When one becomes too stiff to catch himself from falling on slippery pavements, he is sold and replaced. However, Some of the horses have been in the service fourteen years. “There are certain rules and regulations for the Mounted Police which are made largely with the idea of saving both officer and mount. When a man is in the saddle for six hours every day, it would be very tiring to hold the bit and curb reins so,” and Lieut. Martin indicated the method with a string. 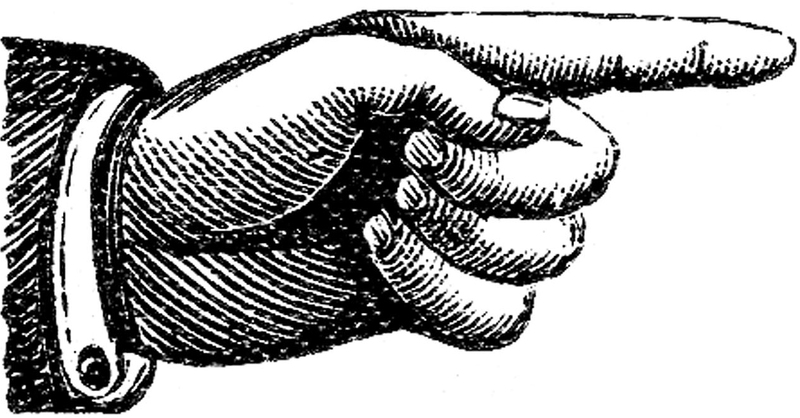 “That is all right on parade, but for ordinary duty the officers hold the bit rein in the left hand and throw the curb rein over the pommel, leaving the right hand free. The rouls have all been removed from the spurs, and the points blunted and even these are rarely used. Our horses are kept in the best condition and well trained. Captain Lavin is chief of traffic squad. Major Bauder is drill master. Lieut. Martin is in direct com mand with Lieut. Weideling in charge of the detail. Under them are five sergeants and the mounted officers. Officer Cairns is bugler; Officer Moran, color bearer, with Chief Fitzmorris in executive control. All in all, our mounted police give us genuine cause for pride, for from the snappy roll call and the mount ing of their horses as one man, until they return tired from their day’s work, they are erect, well groomed, courteous and efficient—a great asset to our city, well justifying the annual maintenance expenditure. Chicago’s mounted police unit may be disbanded and its personnel assigned to regular patrol duty as a result of the city building department’s condemnation of the traffic division’s stables at LaSalle and Illinois streets, Chief of Police indicated yesterday. More than $15,000 would be required to remodel the stables in compliance with safety regulations and an exhaustive search has revealed only one building near the loop suitable for stable purposes. Its owner, the chief declared, has demanded a monthly rental of $1,000 and the execution of a ten year lease by the city. A police horse is fine in a parade, but not so good in a traffic jam in the loop. A motorcycle, statisticians claim, is better, more efficient, and doesn’t eat hay. Acting on this theory, Chief of Police Morgan A. Collins, who says he loves horses, but can’t let sentimentality rule the police department, yesterday announced that the 81 horses now available for the 74 riders in Capt. Patrick Hogan’s traffic squad, must be disposed of, and their places taken by motorcycles within the year. Most of the changes will be made, the chief projected, within two months. Comparing the arithmetic involved in the change, Chief Collins pointed out that the average police horse costs about $250, but entails an upkeep of $100 a month. A motorcycle costs $300 at first, but not much later. O, there will always be a few veterans who are excellent horse riders. We’ll rent our parade horses from a riding academy. Up at the traffic squad’s headquarters on the near north side, Capt. Hogan reported much consternation among the men aqs they anticipated the passing of the horses. Chief of Police Collins has decided to replace the mounted policemen stationed in the loop with motorcycle men because of the high cost of caring for horses. 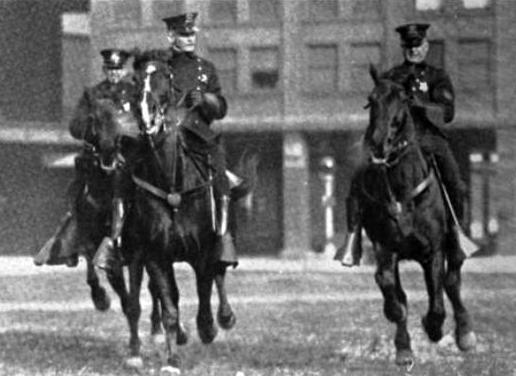 LEFT TO RIGHT: William Kubiak and James O’Malley, mounted policemen; Robert Williams and Joseph Hyland, motorcycle policemen; George Lambling, mounted policeman, in front of the police garage at 13th street and Indiana avenue. Horses Help Cops in Loop, Reply to Collins. “Neigh! Neigh!” snorted the city’s police horses yesterday on the suggestion they soon would be attached to milk wagons. “Nay! Nay!” said the business agent of their union to the proposal of Chief of Police Collins to mount his traffic cops to motorcycles instead of on horses. The chief found he was dealing with an organized unit of skilled labor when he decided to put horses on the retired list. Not only are the horses organized, but they have at least one million friends here in Chicago. The Horse Association of America came riding into the chief’s camp yesterday announcing that the reinforcements were being mobilized. It’s ‘to horse’ with us. Man’s best friend in time of need is now in need of the friendship of man. There will be many thunders of protest before we see the beautiful and intelligent horses now used by the traffic squad of the Chicago police department ousted as insufficient and superannuated. It may be the motor age, but we have not yet passed the age of horse sense. Aside from man’s obligation to the horse, without which he probably still would be in the savage state—aside from the sentimentality it is not practical to junk the horses for the motorcycle. New York tried it and after a time came to find the horse indispensable inn traffic regulation and in keeping order. Now New York has 500 police horse. Former Commissioner R. Enright reported that he found one mounted policeman equal to eight or ten policemen on foot, or on a motorcycle. The chief’s figures that it costs $250 a month per horse for maintenance shows something is wrong. A dozen teaming contractors have offered to care for the horses at $50 per month, including shoeing. The city has appropriated for 19 hostlers to care for 89 horses. One hostler easily can care for eight horses a day which shows the city has eight too many. Many prominent men and firms will demand retention of the horses as available to the police department. 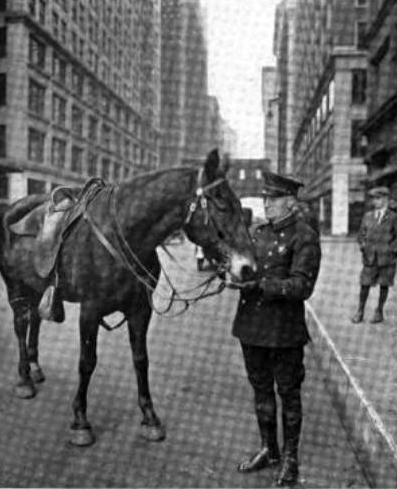 LEFT: Mounted Chicago Police Officer writes a parking ticket in 1934. 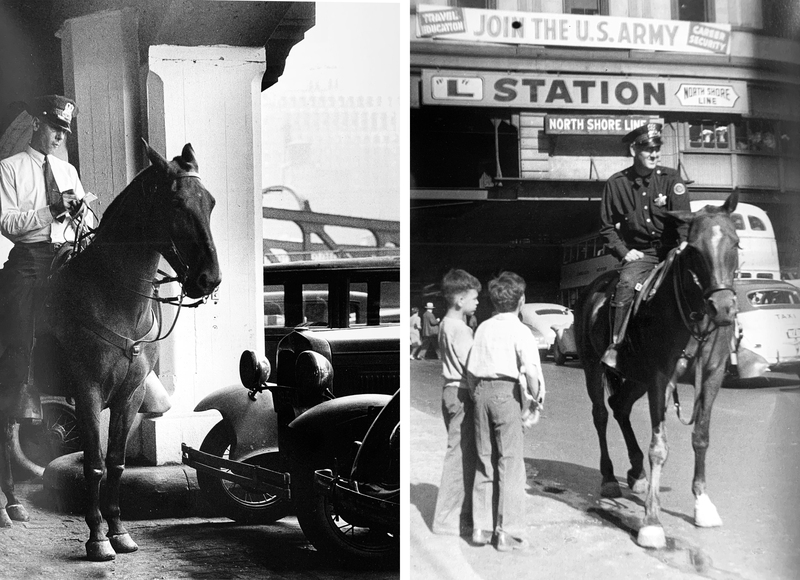 RIGHT: Mounted Chicago Police Officer talking to children in 1945. Capt. Patrick Hogan, in charge of the traffic division, also spoke with feeling for the horse. 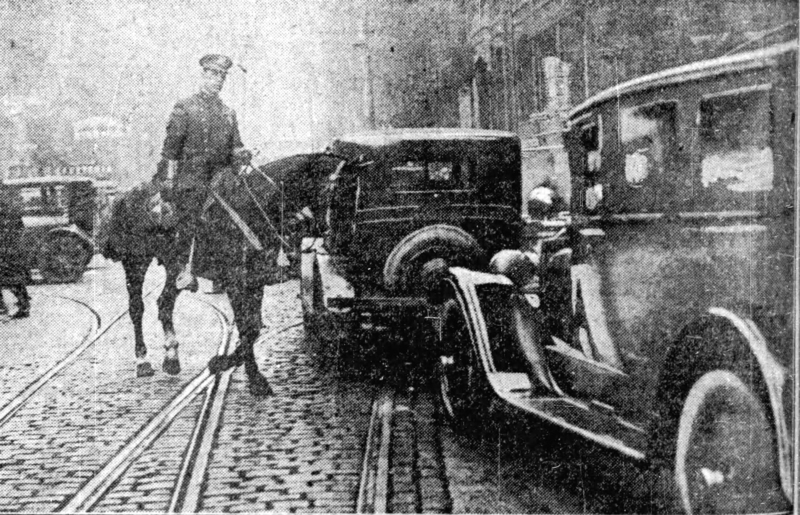 An automobile has been parked too long and the mounted policeman stops and dismounts. The policeman then sees some one getting into the car across the street or up the block and the policeman goes to it. Do you think that first car could get away? Never. The horse would block it even at the risk of injury. It has been done time and again. Another thing: A person is hurt and there is no vehicle handy to remove him. The horse will kneel down—lie down if necessary—so the injured person can be put on his back. 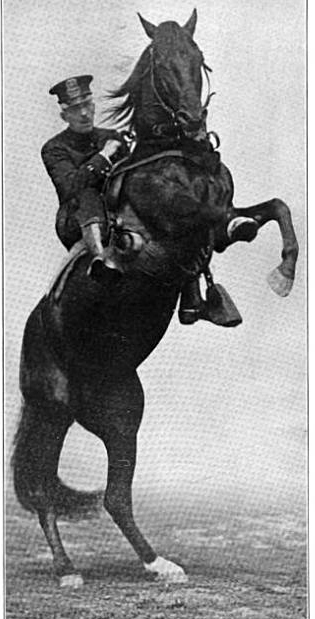 A mounted policeman jumps down to chase a person on foot. If he were on a motorcycle any one could take the machine and ride off with it. Not so with a horse. Police horses wouldn’t let a stranger ride them. Capt. Hogan refused to discuss a charge that the traffic division gets undesirable men. Many of the mounted police are former cavalry or artillery men who knew horses and make pets of them. Chief Collins said yesterday he had not changed his mind. The horses are to go when the next budget is made up, so he says. POLICE HORSES’ FRIENDS SAY MOTORCYCLES CAN’T DO THEIR WORK. Mounted Policeman Nick Reedy riding his horse against traffic at Washington and Dearborn streets. It is declared that motorcycles would make this necessary task a hazardous one. The faithful and familiar horses of the police traffic division neared the end of their careers yesterday, but all had in store years of leisure on rich pastures in the country or the warmth and security of city stables. In a few days 25 motorcycles will carry loop traffic policemen. Sealed bids for the 40 horses were opened by Leo A. Murray, city purchasing agent, and in every case the bid for an animal was accompanied by the promise of good care and feeding and their use for pleasure riding only. Policeman Michael Dineen bid $25 for his bay gelding “Bob” which he has ridden for 20 years. With his bid was a letter stating that his horse had been promised a good home for life on the Tribune farm near Wheaton. Other bids, which ranged from $1 to $314, stipulated that the policeman who had ridden the animal would have the privilege of visiting and riding his horse any time he wished. One woman phoned Murray and asked him to announce to the policemen who were present at the opening of the bids that if they wished to buy their horses they could obtain stable space in the city at a low cost. John Sherman, of 353 E. Ohio st., bid $5 for a horse which he said he sold to the police department for $1 when he entered service during the war. Sherman wanted the horse returned to his farm near Libertyville. The highest bid was made by Jerome Johnson, an attorney with offices at 1 N. LaSalle st. who wanted a black mare for personal use. The Black Horse troop sought to buy 18 animals for $1 each including equipment. The Rev. Paul T. Saunder of the Institute Community center of Palos Park bid $50 for a black gelding which he said would be used for the enjoyment of under-privileged children. Murray said the bids will be considered carefully and then he would make his recommendations to the finance committee which must pass the sales. 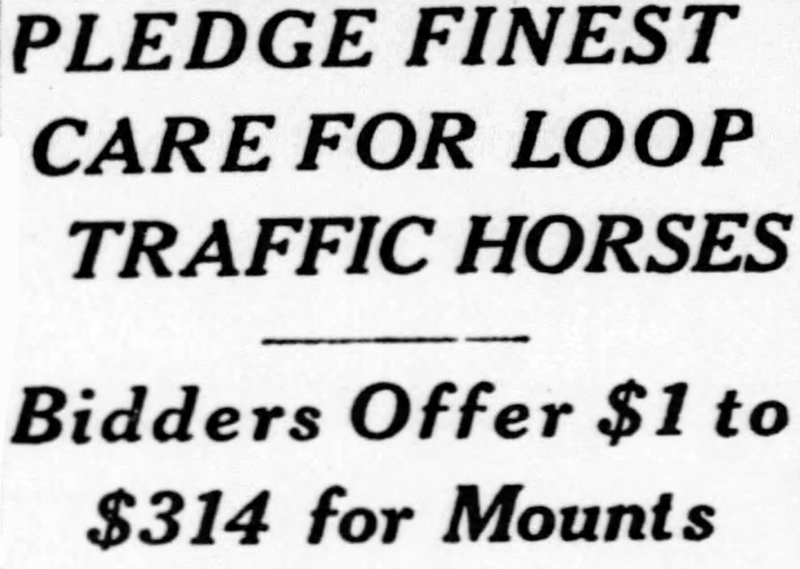 No one appeared to think that the policemen who bid on their own mounts would have any trouble getting them. 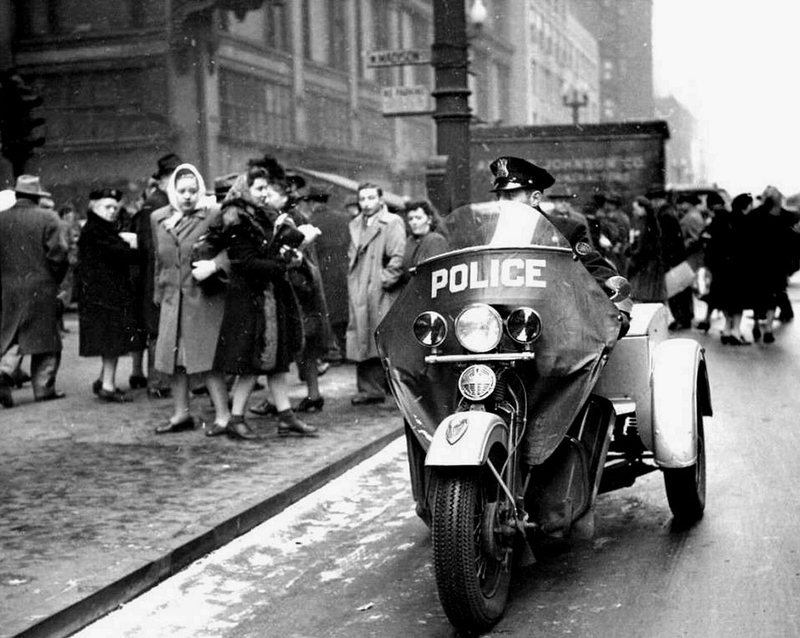 One of the 25 Chicago Police motorcycles which replaced the horses from Chicago’s mounted police squad in 1948. Riding and stable equipment left behind when the city’s 40 police horses were sold last month will be advertised for sale soon, the city purchasing department announced yesterday. Included will be 150 saddles and accompanying riding equipment, along with such stable equipment as vacuum cleaners, curry combs, water pails, stalls, and metal feed boxes. Also to be offered are two tons of oats and 1½ tons of hay. Once the advertising is started, perspective bidders may inspect the lots in the police stables at 262 E. Illinois st. The horses are being replaced in Loop traffic work by motorcycles. Chicago’s new team of mounted policemen went on patrol for the first time yesterday and were an unqualified hit with the public. The horses were even mire popular than the policemen riding them. In Grant Park, Lincoln Park and Washington Park, crowds gathered in ooh and aah in admiration as the mounted policemen went by. “This adds a littler class to the scene,” said Nora Hussey, 21, who works downtown and was watching Patrolmen Sam Harris, Frank Muczak, Adrian Garcia, and Mike McDonald patrol in Grant Park. 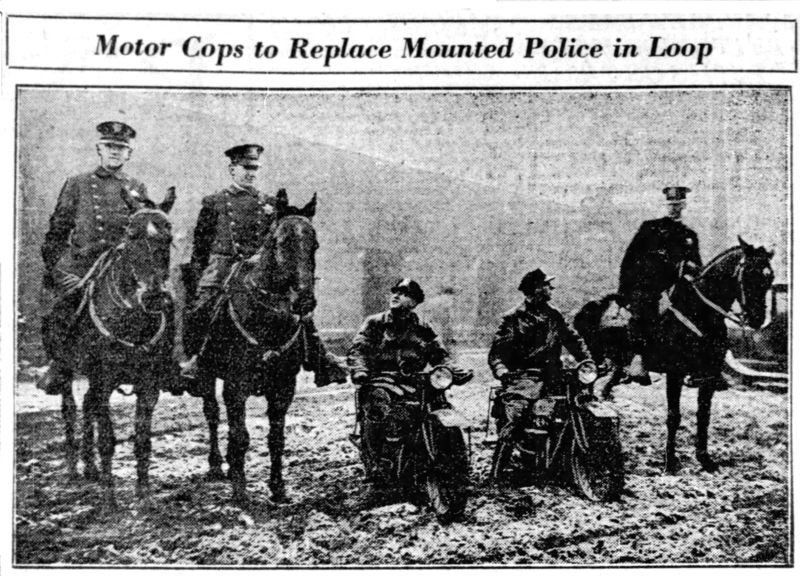 The police department, which phased out its previous team of mounted policemen in the years just after World War II, thinks bringing them back is a good idea, too. The idea is to have highly mobile and highly visible policemen on duty in the parks. But the department is well aware that there is a touch of glamour and public appeal to a horse that no three-wheel motorcycle or squad car can provide. The horses will be on duty in the parks from noon to 8 p.m. The mounted policemen are not allowed to offer rides and the public is not allowed to feed them. But it’s all right to pet them as a group of Latin-American youngsters found out yesterday in Grant Park. They said they had never been so close to a horse before. I can’t post the picture on here, but I have one of Sgt. Fred Dunsing quoted in the article. He was my great grandfather on my father’s maternal side. Interesting, the cav units had to fight on foot in Cuba. Gramp Dunsing was asked by a wounded enemy soldier for water, and when he gave him his canteen, he got slashed across his face with a bayonet. He never did tell my Grandmother and Great Aunt what happened next. Out of the military he located to Chicago and was one of the first 5 mounted police, as mentioned. Too many stories of his time as a cop, then as a night watchman to get into. I will say that he was a binge alcoholic and knew many speak easy’s during prohibition, but as a customer, and never shut them down on his own.